India’s largest flexible packaging company Uflex has been adjudged number one company in the Packaging and Allied Activities Sector by Dun &Bradstreet (D&B), the world’s leading provider of global business information, knowledge and insight. 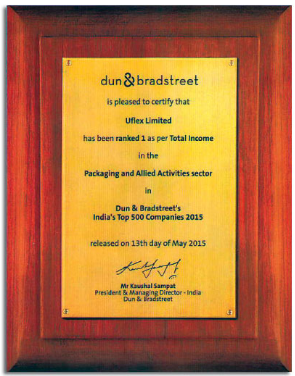 D&B in its 15th edition of the report “India’s Top 500 Companies 2015″ has ranked Uflex as number one, on account of its total income in the year 2014 which is highest by any company in the sector. India’s Top 500 Companies’ is among the longest running reputed publications in the country that ranks and felicitates high performance Indian companies in terms of various financial and operational parameters. This is a great achievement yet again for the company. Ashok Chaturvedi, Chairman and Managing Director of Uflex feels that this award is an acknowledgement of Uflex’s business strategy based on the principle of Client Relationship Management. Today Uflex is the preferred supplier of flexible packaging solutions to the customers across the world. For Uflex, customer is at the core. The association with each client extends far beyond the business realms to form a strong bond as enterprise partners and not merely suppliers.. Uflex Ltd’s continued commitment towards innovation and adding value to clients’ businesses is reflected in the organization’s sustained growth over the years.